How do you change the size of multiple holes at the same time? This is a question many fabricators are faced with when working with customer-supplied drawings. As we all know, CAD designs aren’t perfect and in the machining world, it’s common to have to make adjustments to your CAD geometry so the part comes out machinable to intent. In today’s example, we are going to look at multiple ways you can adjust the size of your hole geometry. Before we get into the different options, let’s first understand that the holes we are making are not being drilled. If we were drilling the holes, we would use the Mill Hole wizard to adjust the hole size and tools we want to use to make the holes. Leave the geometry as it is and adjust the hole size using side allowance in the profile feature. Using the Mill 2 axis wizard and a profile feature, users are given the option for a side allowance. This option is typically used to leave additional stock on the wall for a finish pass. The side allowance can be either a positive or negative number. This gives the programmer the option to undersize or oversize the hole when creating toolpath. If you put a positive number for side allowance, the result will be an undersized hole. If you use a negative number for side allowance, the result will be an oversized hole. In many cases, keeping the geometry as it is and using the toolpath feature options to make adjustments is the quickest and easiest way to adjust multiple holes sizes at the same time. There are many ways to redraw the holes, like how you can snap a new radius to every arc center. This requires you to individually select every hole and create a new arc. If you have 400 holes, that would be a lot of clicking on arc centers. So consider this, first, snap a point to all the arc centers, then snap a radius to all the point locations. This is done in a two-step process. The first thing we want to do is snap points to the arc centers of the holes you want to resize. 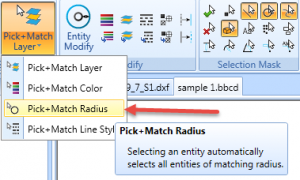 Since you have multiple holes that you’ll need to select, consider using the pick and match by hole size function. This is one of the quick selection options. Pro Tip: Using quick selection lets you pick and match geometry by color, layer, radius, and line style. Using quick selection is a fast selection method. Using this selection method, we can click on 1 hole and all the holes that are that same size will be selected as well. Once we have all the holes selected, our point creation option is points from geometry. We want to make sure arc center is the only option checked. This will snap a point to the arc center of all the holes we selected. Pro Tip: Create a new layer and make it active before creating the points. This will put the points on their own layer and make it easier to isolate just the points from the rest of your geometry. 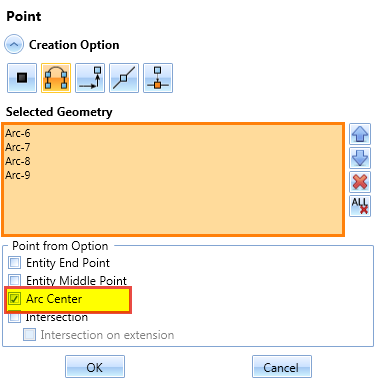 Now that we have points in the centers of all the arcs we want to redraw, we’ll use the arc center creation option, select all our point locations using the multi-picking method, enter the radius size we want for the holes, and that’s it. Another method to make our hole sizes larger or smaller is using scale. We can use a scale factor to increase or decrease the size of geometry. You’ll find scale on the utilities tab. Our first step is to select the geometry we want to scale. 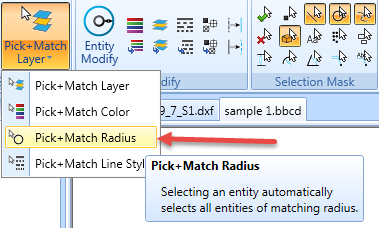 Again, using the pick and match method by radius allows us to quickly select all the holes that are the same size. 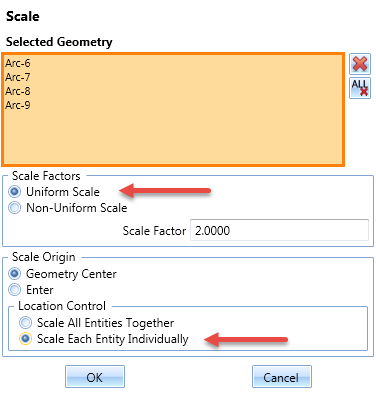 Next step is to set the scale factors; you can choose uniform scale or non-uniform scale. In this example, we want our geometry to scale the same in XYZ, so we will use uniform scale. If we wanted our geometry to scale different values in X Y or Z, or if we wanted the result to be larger in Y and in X, we could use non-uniform scale. Next step is the create the scale factor. This is easy to calculate, just divide the size of the hole you want by the size of the hole geometry currently. This is your scale factor. Next, we will choose the scale origin setting. You can pick from geometry center or enter. In our example, we will use geometry center. Lastly, we will adjust the location control. 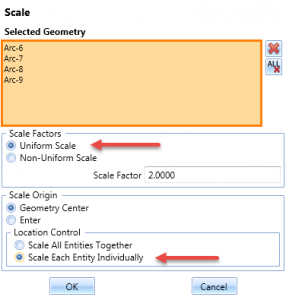 We have 2 options here, either scale all entities together or scale each entity individually. Because we want each hole size to grow or shrink independently, we use the scale each entity individually function. There you have it! Any one of these methods will allow the operator to adjust the size of your holes, under or over as needed. Please comment below what method you use most and why. Thanks for reading another Teach Tuesday, see you next week! Learn more about BobCAD-CAM Milling products HERE and find the right fit for your shop! Questions? Call us at 877-838-1275.